It's been a while since I've cooked a meal from the African continent. Tonight's meal of Samaki wa Kuaaga (Swahili for fried fish) and Sukuma Wiki (collard greens-translated, means 'to push the week' - implying food used to stretch the week), with a side of rice was simple and surprisingly delicious. Located in the eastern part of Africa, Kenya borders Somalia, Ethiopia, Sudan, Uganda and Tanzania as well as the Indian Ocean. 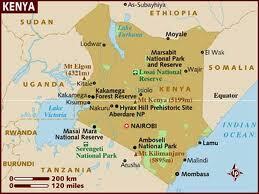 Kenya is internationally known for its vast wildlife and savannas and is home to 42 different ethnic tribes. Interestingly, Kenya's culinary history is one dominated by oral tradition handed down through generations. In many tribes, men do more of the cooking than women. Black eyed peas, ground nuts, bananas, coconuts, beans, greens, casava, yams, ginger, cayenne and okra are all commonly eaten foods and spices Kenyan's enjoy. Add the fish, lime/lemon juice, garlic salt and cayenne pepper to a large, non-reactive bowl and set aside to marinate for 20-30 minutes. Heat the oil in a saute pan or skillet over medium-high heat. Remove the fish fillets from the marinade and pat dry with paper towels. Fry the fillets in the hot oil until browned on each side. Heat the oil over medium heat in a heavy bottomed pot. Add the onion and saute until translucent. Add the greens in batches, sauteing and stirring each addition until it is fully wilted. Add the water or stock, salt and pepper. Bring to a boil, then reduce heat to low and simmer gently until tender, from 25-45 minutes depending on the type of green. Adjust seasoning and serve with a little bit of the broth, or "potlikker". I just love good greens, and these just sound delicious. I'm also a fan of talapia and I have got to say spicy with lemon and peppers and garlic sounds well, just about perfect. I am sitting in my studio with a gentleman named, Job, who is originally from Kenya. As Job and I were discussing health and nutrition, I decided to show him your blog. Job likes the recipe you chose, the photos, and the history you touched upon of Kenya. Hi Cathy: Job's comments are the highest compliment I could hope for. I'm so glad he felt it was authentic. Thank you both for taking the time to read and comment! Push the week ahead, huh? I'm intrigued!